I asked my friend what do you love the most about your diet? And the answer came: The Cheating Day! Open candy bar, ice cream, chocolate, caramel, jelly beans, … They are all fair game! Whatever you’re craving for; pizza, cheeseburger, doughnut… No food is off limits. It’s the day you honor your body’s food wishes and stop counting calories. Isn’t that a genius plan! A well-justified treat for being such a saint all week and sticking to your diet, so what can be better excuse to dig intuitively in my decadent, fudgy, naughty brownie cake. They taste as great as they sound, they are so addictive, am sure you’ll want to make a second batch before the first is finished. I agree with you that there must be some law to stops bloggers from uploading tempting pictures of sweets and have mercy on those who are dieting, but this is why cheating meals are designed for, no? Come on, give your body a break those brownies have never looked so appetizing! Preheat oven to 180°C. Grease 9×9 inch square pan. Melt chocolate in a medium saucepan over low heat and combine to butter. Cool 10 minutes. Stir in sugar, egg, zest, flour, chocolate pieces and milk. Spread mixture into pan and decorate with walnuts. Bake 25-30mn. Cover pan with foil bake for further 20 minutes. If the brownie wobbles in the middle, put back in the oven and bake for another 5 minutes or until the top has a shiny crust and sides are beginning to come away from the pan. Dust brownies with sifted cocoa powder if desired and cut into squares. 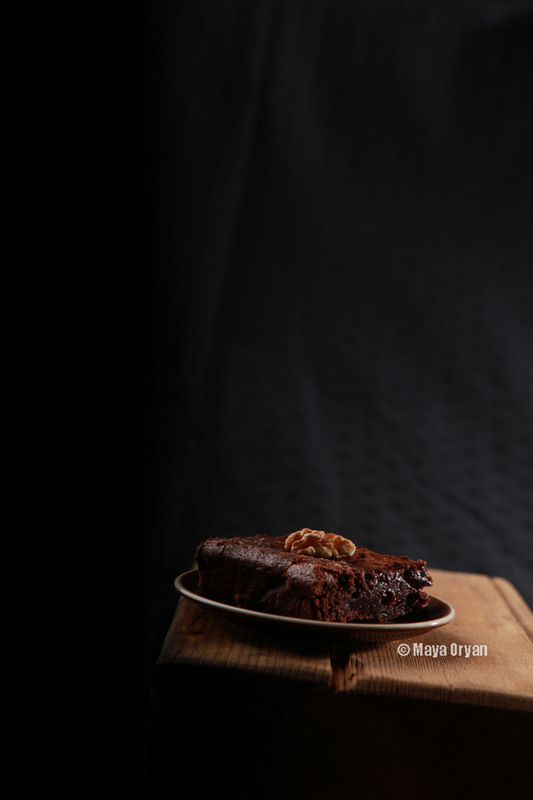 This entry was posted in Desserts, Recipes and tagged brownie, brownies, Cake, chocolate, chocolate melt, Cook Book, dessert, Dubai Food Stylist, food photography, fudge, Lebanon Food Stylist, Maya Oryan, Menu, walnut by Maya Oryan. Bookmark the permalink. Oh my goodness…. I would LOVE to have this right about now! LOL Of course it’s fat free, right? LOL Thanks, great post! The photo is fantastic. I want one now. Cheat day, hmmmmm….